While many people like to turn their nose up at casseroles, I’m a bit intrigued by them. Why, I have no idea–since casseroles are really just meant to be quick thrown together meals. Maybe it’s because I’m Asian and I didn’t grow up on dishes like this–can it be? That a casserole is…I’m going to say it…just a tad exotic to someone like me? The very thought makes me giggle. But do keep in mind, that I’ve only had meatloaf 2 years ago. Come to think of it, what many people deem to be classic American comfort food, I’ve really never had. This sounds like a challenge, no? I think I might have to find time to make some meatloaf or pot roast in the near future! Anyhow, after some blog surfing I found this gem! Was i dying to make a casserole…not especially…but if you’re going to make a casserole, chicken tortilla is certainly the way to go. And boy, was I happy I gave this recipe a chance–it’s absolutely delicious! To be honest, I felt as thought I was having a wonderful plate of chicken nachos. I gave my sister’s boyfriend the first taste, and he gobbled it right up. This is seriously one tasty dinner if you’re short on time. Bonus? Leftovers are delicious! I definitely had a few people at work do the sniff and double take. Pat the chicken halves dry and season with salt and pepper. Heat 1 tablespoon of the olive oil in a 10-12 inch oven-safe skillet over medium-high heat. Add the chicken to the pan and cook until golden brown on both sides. Chicken may not be thoroughly cooked at this time. You will be cooking it completely later. Remove from pan and set aside. 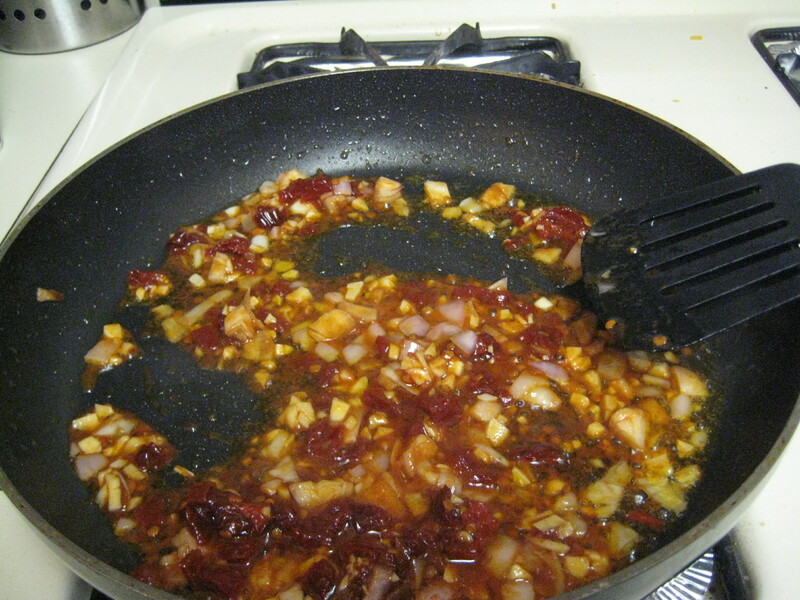 Add the remaining oil, shallot, garlic, chipotle, dash of parika, and ¼ teaspoon of salt. Cook just until fragrant, about 30 seconds. Add the chicken broth, scrape the browned bits from the bottom of the pan, and bring to a simmer. Stir in half of the tortilla chips. Nestle the chicken into the broth and cook over medium-low heat until cooked through in about 10 minutes. Transfer the cooked chicken pieces to a cutting board and shred into bite-sized pieces. I use two forks to pry the meat apart. Return the shredded chicken to the skillet with the tomatoes, ½ cup of the shredded cheddar cheese, 1 tablespoon of the cilantro, and a dash of pepper. 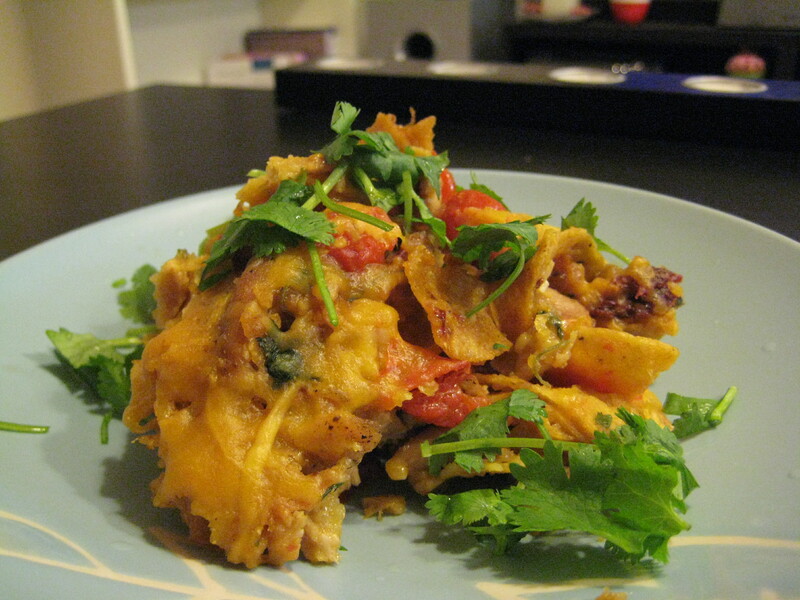 Stir in the other half of the tortilla chips until they are incorporated and moistened. Sprinkle the remaining cheese on top and place the pan under the broiler until the cheese is melted and browning, about 2-3 minutes. 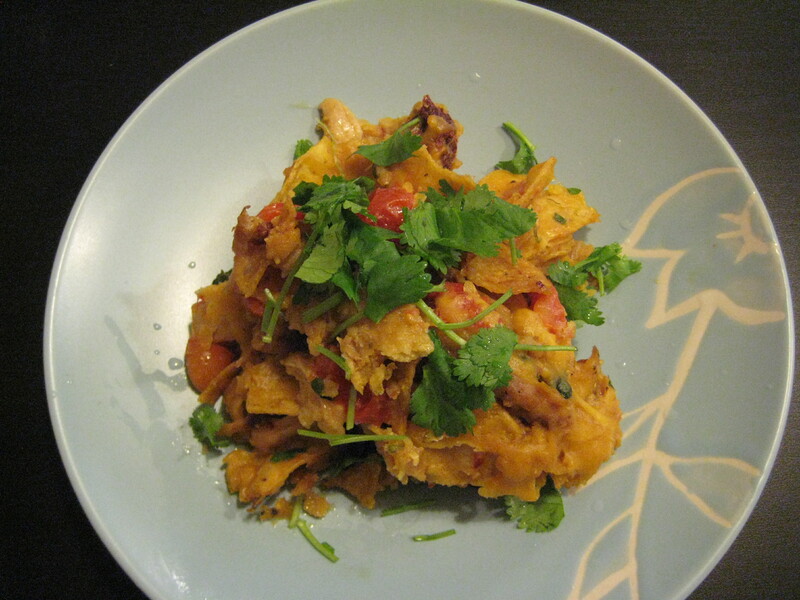 Top with remaining cilantro and serve, allowing the casserole to cool 5 minutes before serving.